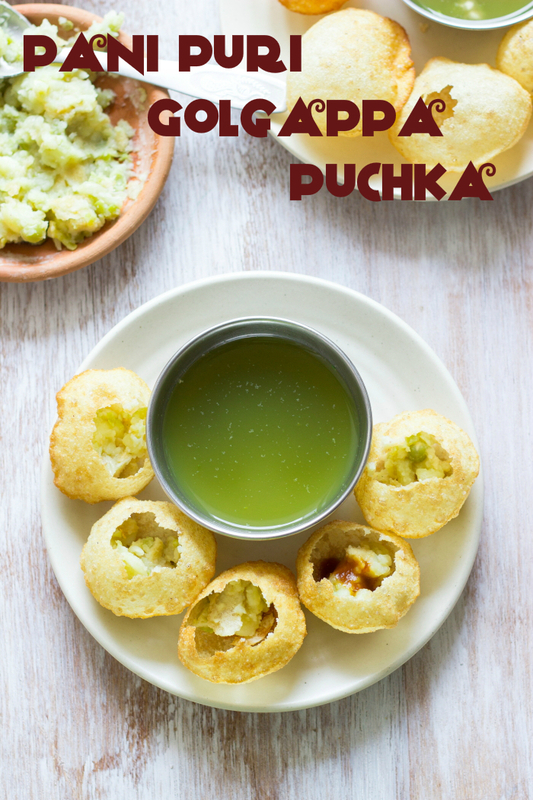 The KING of Indian Street food - Pani Puri or Golgappa or Puchka. Crispy fried dough balls stuffed with a potato pea mash, sweet tamarind chutney and a chilled spicy coriander-mint water. What kind of a place would the world be if there was no street food? Boring??? I think Street Food talks a lot more than Restaurant food. Street food is like the soul of the place. You learn so much more about the culture and people just by looking at the street food being sold. While restaurant food is usually mellowed down and modified to suit the palate of the customers it serves, street food is bold and original. If you haven't eaten street food, you probably haven't tasted the city yet. India wouldn't be India if it were not for its "Chaat". Chaat refers to a variety of savory sweet tangy food sold on the roadsides from either small stalls or little food carts. And according to me, the most popular Chaat has always been - Pani Puri, also known as Golgappa in the North and Puchka towards the East. Names may vary, but the love for this dish does not. You can find Pani Puri being sold in every nook and corner of any city in India. But each one has their own favorite stall that they are extremely loyal to. Our favorite, is the Bihari guy outside a supermarket in Jayanagar 4th Block. He makes the crispest puri there is. I have never made my own Puris, that is an experiment for some other day. Buying is a lot easier. Puris are crispy hollow balls made of deep fried dough. These balls are gently tapped with fingers to make a hole on one side. Then comes the stuffing, the stuffing varies according to the region you are in. 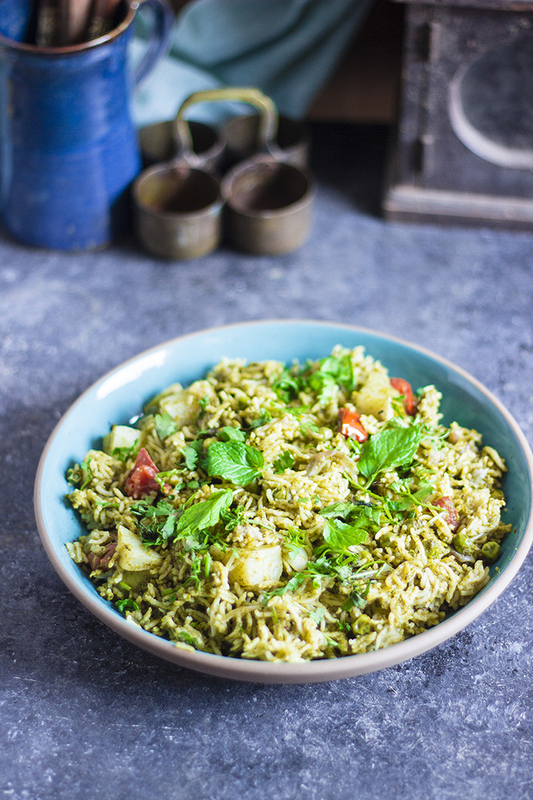 It can be a potato mash, potato-green pea mash, sprouts, black chana, chickpeas etc. A little bit of this stuffed is stuffed into the puri. Then comes the celebration - the Pani or water. The Pani awakens every teeny weeny taste bud in your mouth. It is sour, it is spicy, it is salty. 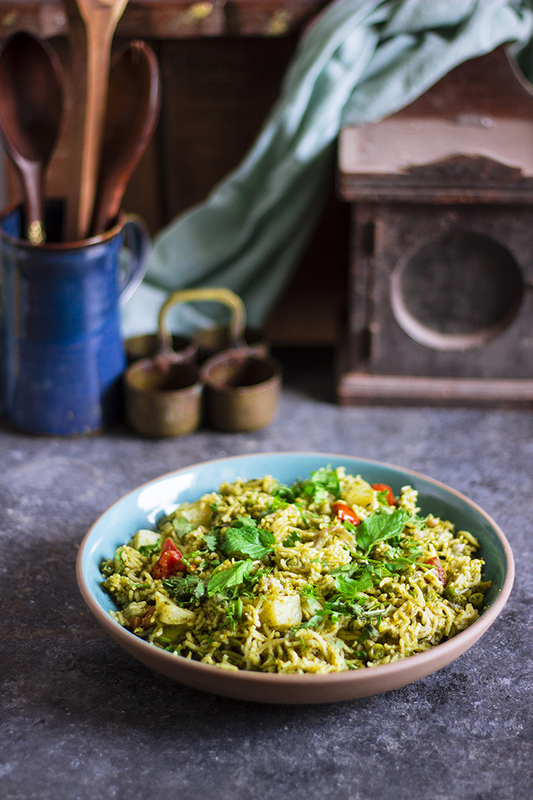 Made of mint, coriander, tamarind, chillies and spices, it is a flavor bomb. One of the essential ingredients for making the perfect pani is Black Salt or Kala Namak. A funky smelling salt that has its origin in the Himalayas. The pani is stirred before dipping the puri in it to fill up the puri with this wonderful Pani. 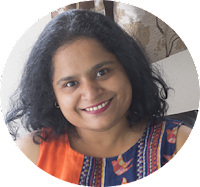 Now if you want, you can add jaggery or sugar to the Pani to make it slightly sweet, or you can make the Date Tamarind Chutney like it is traditionally done and spoon in a little of it along with the Pani to get a slightly sweet Pani Puri. Keeping the sweet chutney separate from the Pani allows you to adjust the sweetness according to each individual's taste. Once the puri is filled with the pani, it has to be eaten immediately. Eating a Pani Puri can be tricky if you have never had it. You have to eat the puri in one go. It is like a filled water balloon, you try to cut it in half and all the water will be out and you will be left with a soggy puri. My love for Pani Puri comes from my Dad. He never missed a chance to eat a plate of pani puri, neither does Raj. When I am shopping for weekly groceries at the super market, he's outside sneaking a plate of pani puri. In this one matter, we are definitely made for each other. We are 2 bottomless holes when it comes to pani puris. We can just keep on going!! Pani Puri | Golgappa | Puchka is an Indian Street food or Chaat item in which crispy fried dough balls are stuffed with mashed potatoes, spicy coriander-mint water and a sweet tamarind chutney. Soak the dried green peas overnight or for 6-8 hours. Drain and boil them until done. I usually pressure cook them for 2-3 whistles. Mash together the potatoes and the green peas. Add in salt and chaat masala and mix well. Keep it slightly under seasoned as the pani is already salty. Soak the tamarind in a cup of water for 15 minutes and squeeze out the liquid. Remove the pulp and keep the tamarind juice aside. Blend together the coriander leaves, mint leaves and green chilli with a little water into a smooth puree. Add the puree to 1 litre of water , preferably cold. Add the cumin powder, tamarind juice, black salt and chaat masala to taste. Chill the green pani in the fridge until serving. Alternately, you can add ice to the pani to serve immediately. Strain the water before serving. Gently tap a hole in the puri using your finger. Spoon in the potato stuffing into the puri. Now pour in the date tamarind chutney if you like the pani puri to be slightly sweet. Spoon in the green pani and eat immediately. And there was also the fact, that this has been a favorite family Picnic meal forever. Literally, forever, as long as I can remember!! We don't go on picnics anymore, although I think we totally should. But in my head, you can only go for picnic to the beach. You can remove the girl from Goa, but not the Goa from the girl !! I miss that deep blue sea, the white sand and the shade of coconut trees under which we spread our bedsheets and picniced. While all my cousins and Gee swam without fear of the big bad ocean, I safely sat on the shore and built sand castles. They may think they enjoyed more, but I was closer to the food. Ha!! I like Bangalore, but my only complain is it is only flanked by land on all sides, no beaches in site anywhere, the closest one is at least 400kms away. I can go to the gardens, but let's face it a garden is no beach and once you have tasted the sea, there is just no satisfying the soul with anything else!! So no picnics in sight anywhere, but we do take a lot of road trips. Not as many as I would like off late, but hey, something is better than nothing. And our little triangular Chutney Sandwich still accompanies us on these road trips along with bags of chips and bottles of soft drinks and chocolates. Of course chocolates!!! Sometimes this Coriander Chutney Sandwich becomes my Saturday breakfast. I make the Coriander Chutney at night and store it in the fridge, so Saturday breakfast is a breeze. No one has to wait for me to wake up and make breakfast - slapping on some butter and chutney onto 2 slices of bread is definitely child's play. So I get to sleep in. And I myself don't need to worry about "what to cook for breakfast", the most tiresome question I ask myself most days. 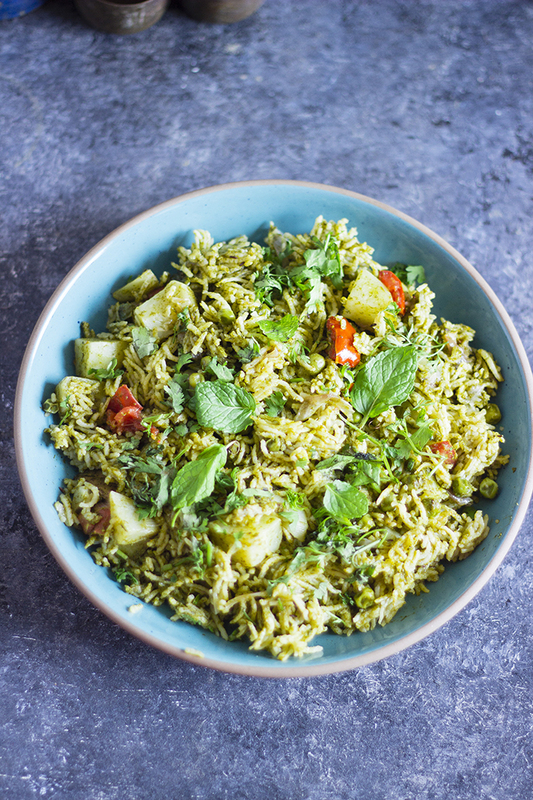 This Coriander Chutney is made by blending / grinding together fresh grated coconut, fresh coriander leaves, green chillies for the heat, tamarind for sourness and salt with a little bit of water. A regular coconut chutney that is eaten with Dosa or Idli usually has a lot more of coconut than coriander, but here the quantity of coriander is far more than the coconut. The coconut is there just to add body to the chutney and perhaps, a little sweetness, but otherwise the Coriander steals the show. Add a little mint and sugar to make this chutney extra special. This is one of "those" recipes which does not follow a recipe. Just take the quantity of the ingredients below as a guideline and change it to suit your palate. There is no right or wrong in making a chutney. The only thing I'd be cautious about is the quantity of water, start small and increase as you go. A watery chutney will lead to a soggy sandwich and no one likes a soggy sandwich, am I right? Except Gee, of course, how can sibling ever agree on anything, I wonder!!! 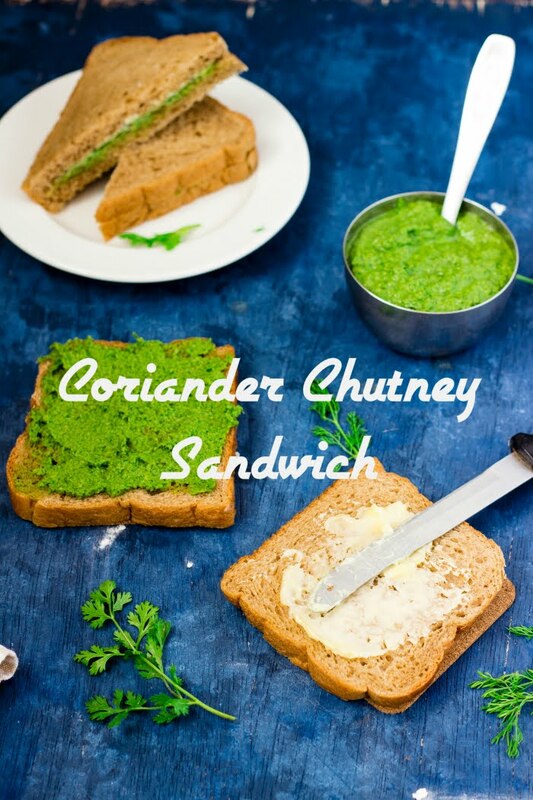 Coriander Chutney Sandwich is made using a simple coconut and coriander chutney, bread and butter. Grind/ blend together all the ingredients to get a smooth chutney. Add the water by the spoonful to get a thick chutney. Do not add all the water in the beginning, the coriander and coconut will leave their own juices and the chutney may end up being runny. Spread one slice of bread with butter and the other with the coriander chutney. Stick the 2 slices together and cut into triangles to make Coriander Chutney Sandwich.